I work at the libertarian Cato Institute (aka, America’s most effective think tank), and I think libertarianism is the philosophy that best reflects human decency. But I sometimes wonder why libertarians aren’t more persuasive and why there aren’t any libertarian societies. However, maybe there’s a light at the end of the tunnel. I’ve been asked by several readers to comment on the debate about whether America is enjoying a libertarian phase, particularly among the so-called millenials. This discussion was triggered by a feature article in the New York Times magazine. You won’t be surprised to learn that I hope the answer is yes. So it goes without saying (but I’ll say it anyhow) that my fingers are crossed that Nick Gillespie of Reason is correct is his reaction to the NYT article. Though I worry that the social capital of the American people (of all ages) has been sufficiently eroded that they won’t permit the entitlement reforms and program restructurings that are necessary to control – and hopefully reduce – the burden of government spending. So perhaps David Frum’s take in The Atlantic is more accurate, even if I hope he’s wrong. For what it’s worth, I’m a bit more optimistic after reading Ben Domenech’s analysis for The Federalist. I’m a fiscal policy wonk rather than a big-picture libertarian, so I’m not particularly qualified to assess who is right. That being said, you can sense a bit of my hopefulness in the post-post-postscript below. P.S. Since we’re on the topic of libertarianism, let’s talk about Harry Reid’s favorite people, Charles Koch and David Koch. If you get your news from the establishment media, you doubtlessly think these supposedly evil billionaire brothers are dictating political outcomes with their ostensibly lavish spending on campaigns. Yet if you look at a list of the top 100 individual donors to political races, David Koch is #90 and Charles Koch isn’t even on the list. 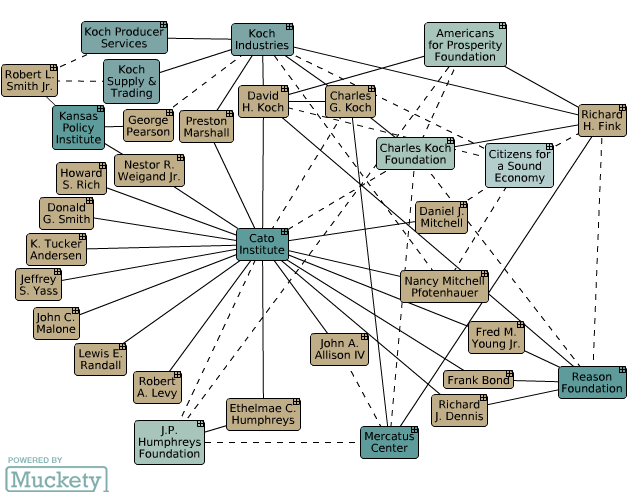 Some of you may be thinking that they funnel their largesse through other vehicles, but even when you look at organizational giving, Koch Industries is only #36 on the list. Paul Bedard of the Washington Examiner slices and dices the data. …only two of the nation’s top 20 donors to federal campaigns favor the GOP, and a stunning 11 are labor unions including the AFL-CIO, and both teachers unions, according to a new report. The highly respected Center for Responsive Politics put the pro-Democratic fundraising group ActBlue at the top of the organization donor list, coughing up over $30 million, with 99 percent going to Democrats. Way down at No. 36 is Koch Industries, the conservatively run company Democrats claim control the GOP. …Among individuals, former New York Mayor Michael Bloomberg ranked second in donations, with $8,710,678 of his $9,495,798 going to Democrats and Democratic causes. …Among individual donors, the top three are also Democrats. The rest of the list is evenly split in who they give money to. P.P.S. Since we’re talking about the Kochs, I find it laughable that conspiracy mongers on the left somehow thought I was worth including in this flowchart. The other people are all donors, directors, or executives. I’m just a policy wonk. Heck, they didn’t even make the one connection that does exist, which is the fact that I used to be married to Nancy. P.P.P.S. On the other hand, I feel honored but unworthy to have been subject of a profile by the folks at United Liberty. According to the title, I’m the “guardian angel” of American taxpayers. Needless to say, I wish I had the power to protect folks from rapacious government. Here’s what the article actually says about my angelic qualities. World renowned tax expert and Cato Institute scholar Dan Mitchell thinks of politicians as characters in old cartoons that, when faced with a decision, suddenly find they’ve an angel on one shoulder and a devil on the other, both handing out advice as to the right move. He sees himself, flashing a grin that signals you shouldn’t take him too seriously, as the angel. “My job is to convince [politicians] to do what’s right for the country, not what’s right for their own political aspirations,” he says. The article also explains what got me involved in the fight for liberty. Mitchell has both a bachelor’s and master’s degree in economics from UGA, as well as a PhD in economics from George Mason University. But he got his start as a limited government conservative as a high school student who, like many others, found himself struck by the wisdom of Ronald Reagan. “I was drawn to his message that government was the problem, not the solution,” he says. “One thing that was definitely part of Regan’s philosophy that I got right away was that you shouldn’t punish success and you shouldn’t reward bad behavior.” Reagan, he says, accomplished more on spending than people give him credit for, and succeeded largely due to his policy of tax rate reductions, the taming of inflation, the slight reduction in all federal spending, and the massive shift away from domestic spending toward defense spending. But regular readers already know I have a man-crush on The Gipper. The final excerpt explains why I’m slightly optimistic, though I certainly don’t expect to put myself out of a job. Simply stated, even if we get genuine entitlement reform and put the brakes on wasteful discretionary spending, it will still be a full-time job to keep the politicians from backsliding. Anyhow, read the entire profile if you have a few minutes to kill. …as well as something for our collection of anti-libertarian humor. Reminds me of the libertarian lifeguard cartoon, at least in the sense that we supposedly are indifferent to children. Though obviously an absurd caricature. After all, libertarians want school choice to help poor kids while the statists are the ones standing in the schoolhouse door. I wish Gary Johnson had won in 2012. I think that the libertarians’ views on most issues are right. Not that I condone their view about drugs being legalized, however, the war on drugs is a waste of taxpayers’ money as well as resources. Let the states decide within their own jurisdictions drug policies and get the federal government out of it. Maybe you’re the archangel that Milton Friedman was looking for to run government efficiently!! !